Sandy specializes in the "Boutique" style website for the small busniess owner and she often uses a template for a quicker turn around time. Templates are relatively easy to customize using code manipulation, images, etc. Over the last five years Sandy has completed several websites as well as offering hosting plans complete with monthly web site updates. Many small business owners either dont have time or the inclination to do such tasks. With the hosting plans, its easy for Sandy to go in and update events or other pertinant information for the website/business owner as she has access to the files and the kowledge and understanding of the code to complete the task. You can reach Sandy for a quote or consultation via the email link at the bottom of every page. The	images	on	this page are screen shot links of web sites Sandy has done most recently. Art on Derry is an artist co-op in Hershey, PA. Located just steps from Hershey Park and the Tanger Outlets at 233 E. Derry Road, Hershey, Pa. Art on Derry is the vision of local stained glass artist, Laird Morgan. Laird saw a glallery/shop setting where local artisits could display and sell their work. Art on Derry currently has abstract artisits, a jewelry artisit, a plein air painter, a wood burning artist, a surrealism drawer/painter, a stained glass artist, and a realism landscape artist. Art on Derry offers classes in various media, studio space rental and will host shows/special events. Dont miss this original, interesting ,unique Artist co-op on your next visit to the Harrisburg/Hershy area. To view this website simply click on the image link. The Manor Restaurant and Lounge is located at 300 South Hershey Road (Rt.39) in Harrisburg, PA. Peter and Kim Zoumas are the owners of this establishment. Peter is a CIA graduate and creates seasonal , fun, reasonably priced , great food. Sandy did this website for them when they purchased the property from the Pavone family who had it for 38 years. Sandy also does The Manor's menu layout for print, business cards, rack cards for hotels, the website's hosting and updates. Click on the screen shot to go to the Manor's website. 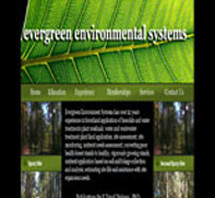 Evergreen Environmental Systems is a consulting firm in Midway, GA. Evergreen Environment Systems has over 30 years experience in forestland application of biosolids and water treatments plant residuals; water and wastewater treatment plant land application; site assessment; site monitoring, nutrient needs assessment; converting poor health forest stands to healthy, vigorously growing stands; nutrient application based on soil and foliage collection and analysis; estimating site life and assistance with site expansion needs. The principle consultant is E.David Dickens PhD. who is also a professor at the Warnell School of Forestry and Natural Resources at the University of Georgia. To view this website simply click on the image link. The Olde Factory can be found at 139 S. Hanover Street, Hummelstown, PA. The Olde Factory is an antiques and crafts co-op just meer miles from Hershey, PA. Sandy has been in the Olde Factory as a vendor since 1999 selling antiques, vintage items, gently used designer clothes, her custom one of a kind jewelry, hand painted stained glass windows and her hand built furniture using antique parts such as old shutters. The Olde Factory is housed in an old shoe and dress factory and is home to some 150 vendors. Its a must see if you are from the area or just visiting the Hershey area. 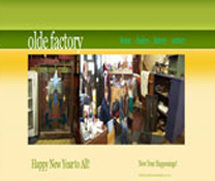 The Olde Factory website can be viewed by clicking on the image to the right. © 2015 sandy calderone. All rights reserved.